Commercial Heavy Duty Manual Juicer. 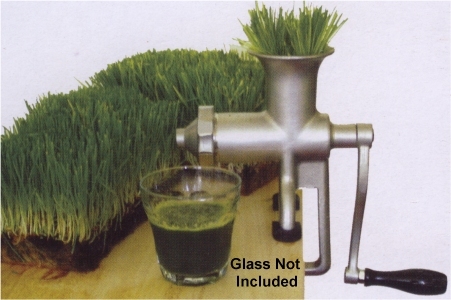 This is an improved design from the "standard" Staineless steel wheatgrass juicer, such as the "Basic to Basics" Stainless Steel Model. The main difference with this model is the shape of the auger, and the end cap. It is designed in such a way to maximize the efficiency of the juicing process. This wheatgrass juicer is made of quality stainless steel for a lifetime of use. It makes an excellent addition to any kitchen. 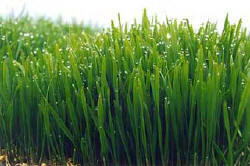 Extracts the healthy benefits of chlorophyll from wheat grass and other leafy greens. The wheat grass juice contains plenty of vitamins, enzymes and minerals to provide the nutrients required by the human body. Through experimental analysis conducted by many U.S. and European scientists, research has shown more that one hundred ingredients, including proteins found in wheatgrass juice. Includes stainless steel auger, stainless steel screen, end cap wrench and plunger. This juicer is also sold as the Hurricane Juicer. Must be less than 1.5" thick and at least 1.75" deep.